Nokia was just in the news yesterday in announcing their upcoming App store. 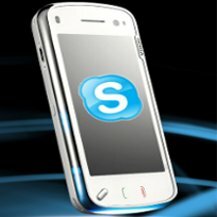 Today, the company announced the integration of Skype to its latest product, the N-97. Skype of course, is for many the preferential voice communication platform of the Web. However, since eBayâ€™s purchase of the company back in 2005, Skype has been on a rocky road toward viability. Now, Nokia and Skype are attempting to leverage the over 400 million Skype subscribers, a move that promises to be a benchmark for the mobile Web. Making money with apps is becoming a trend, and this is as it should be. We have watched so called Web 2.0 startups come and go, and in this particularly unsettling economic climate, many will soon have to “either put up or shut upâ€�, as the saying goes. This news is further indication of ongoing â€œeffortsâ€� by some to take advantage of massive numbers of potential customers (Skype’s 400 million users in this case), via great integration of applications atop excellent electronic platforms. Mobile carriers have been wary of interfacing with Skype for fear of lost revenues. However, the success of Skypeâ€™s affiliation with Hutchison Whampoa via Phone Operator 3, has given rise to the viability of Skype as a money maker. A suggested 20 percent rise in revenues for 3 out of their affiliation with Skype, obviously bears weight for for Nokia. Hutchinson’s methodology has been leveraging their supportive services by engaging users with the use of Skype’s brand and value. The obvious appeal of Skype being its “freeness”, in this case being a key compromise on both ends of business/consumer relationship. Nokia, along with Apple and Microsoft, apparently have a more refined model for how to market products to millions of users. Part of this apparent “advantage” arises out of their potential not only as producers of great devices, but the inherent ability of those devices to support a myriad of applications. Whereas, other Web entities are based largely on less tangible value, “hard” electronic products offer significant advantages. Whether or not mobile companies can shift from “talk time” revenue into an application-based revenue model remains to be seen, but the previous Skype success with Operator 3 reveal great potential. There is discord as to whether these recent initiatives are only short term strategies, and whether they will cause more far reaching negative effects. From the standpoint of Nokia and Skype, there seems to be little to lose, and a great deal to gain.